Recombinant monoclonal antibody to IL4. Pascolizumab is a humanized monoclonal antibody for the treatment of asthma. Figure 1 Effect of pascolizumab binding of IL‐4 inhibits IL‐4 interaction with the alpha chain of the IL‐4 receptor. 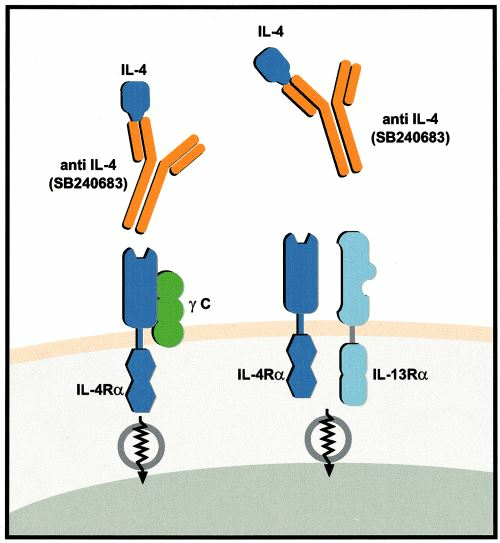 IL=interleukin; anti‐IL‐4=antibody against IL‐4; γ C=gamma signalling chain of the IL‐4 receptor; IL‐4Rα=IL‐4 receptor alpha; IL‐13Rα=IL‐13 receptor alpha. Hart, T. K. , Blackburn, M. N. , Brigham-Burke, M. , Dede, K. , Al-Mahdi, N. , & Zia-Amirhosseini, P. , et al. (2010). Preclinical efficacy and safety of pascolizumab (sb 240683): a humanized anti‐interleukin‐4 antibody with therapeutic potential in asthma. Clin.exp.immunol, 130(1), 93-100. Figure 2 Effect of MoAb 3B9 and pascolizumab on IL‐4‐dependent IgE synthesis from human PBMCs. 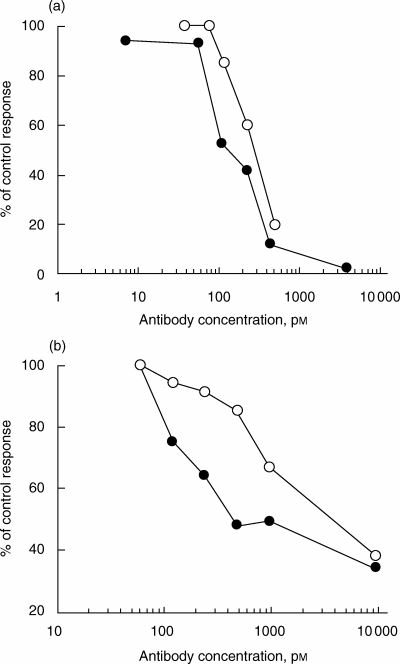 (a) and surface expression of CD23 on purified human tonsillar B cells (b). Results are expressed as percentage of the control response obtained with IL‐4‐stimulated cells. •, MoAb 3B9; , pascolizumab.